Coming from lush green hills of Northern Ireland, Selene is an upstart band trying to break into the crowded field of female-fronted symphonic metal. The return with their second EP, Paradise Over, another album of six songs. Comparisons will be inevitable to begin with. Name your favorite female-fronted melodic, symphonic, power metal band and you'll find obvious elements and similarities. Nightwish. Delain. Epica. Vocalist Shonagh Lyons has a solid and melodic operatic style, thankfully not as piercing as Tarja. She's measured and controlled throughout. After this the elements remain the same. One, of course, is the large and relatively bombastic symphonic layer which, unfortunately, sometimes sounds too much like it comes from synthesizers as within Not Enough or Fade Away. Then, also, those keyboards become a bit quirky and familiar, as they you heard them before elsewhere, within Not Enough. 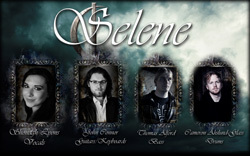 Alternatively, Selene can have a good sense of pacing and groove, where the beat propels the song and keeps it lively. Throw in some catchy hooks and nice, but routine, lead guitar solos and you have the quite accessible and pleasing Still Dreaming. 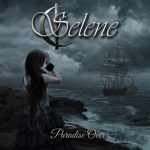 This song, and possibly the title track, display the promise that many fans and music punters have for Selene. Fundamentally, promise and potential is exactly what Selene has going for them. However, what works against them is the simple fact that the sometimes can and may possibly continue to sound derivative of the genre. Here's hoping for the best. Comparisons will be inevitable to begin with. Name your favorite female-fronted melodic, symphonic, power metal band and you'll find obvious elements and similarities. Nightwish. Delain. Epica.